WASHINGTON — It was a pilgrimage of firsts and of unity. That’s how archdiocesan participants in this year’s national March for Life describe their trip to the nation’s capital. 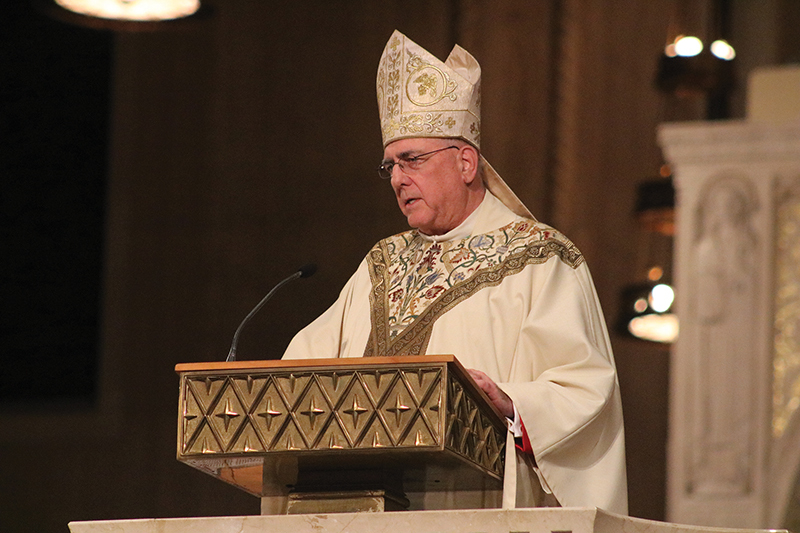 This marked the first time Archbishop Joseph F. Naumann, the new chair of the U.S. bishops’ Committee on Pro-Life Activities, was the main celebrant of the opening Mass of the National Prayer Vigil for Life at the Basilica of the National Shrine of the Immaculate Conception on Jan. 18. Before some 10,000 from across the nation, the archbishop took the pulpit for his homily and said — to much laughter — that he had often wondered what the view was like from up here. He then went on to detail the many deceptions that had gone into the decisions that have led us to today. The reality, he said, is that millions of people volunteer their time, talent and treasure in a variety of ways at thousands of pregnancy resource centers to support the unborn child and parents materially, financially, emotionally, psychologically and spiritually. “These centers of love,” he said, “are committed to accompanying the parents long after the birth of their child” and empower mothers and fathers to thrive for a lifetime. At the root of Christ’s message, the archbishop said, was mercy. “We read in the Gospel tonight about Christianity’s first deathbed conversion,” he said. “One of the prisoners crucified with Our Lord joins the crowd in mocking Jesus. “The other, sometimes called the good thief or Dismas, makes a most beautiful profession of faith. The good thief recognizes in the brutally beaten and apparently defeated Jesus, the Lord of Life. The next day, Archbishop Naumann then delivered the opening prayer for the rally held just prior to the march itself. Other speakers at the rally included the surprise addition of Vice President Mike Pence and his wife Karen, as well as a video call-in from President Donald Trump. There were at least four new archdiocesan leaders marching for the first time this year. Debra Niesen became the archdiocese’s pro-life consultant within the past few months, and Ann Marie Alvey became the archdiocese’s Project Rachel director only six months ago. Additionally, Shelly Buhler became Hayden High School’s president this past summer, and Father Carter Zielinski, the high school’s chaplain, is new not just to his appointment but also to the priesthood, having been ordained last June. As she reflected on the archbishop’s homily, Niesen said she appreciated how the archbishop shared the deception involved in the 1973 Supreme Court decisions. “Many might not have known about the deceit involved,” she said. She also appreciated how the archbishop, in both his homily at the basilica and one at a Mass the next day for Kansas pilgrims, was “always circling back to God’s mercy” and love for the unborn but also for those involved in abortion. Describing her entire experience as “a call to action,” Niesen said she was “just overwhelmed by the incredible witness of so many people,” and in particular, the young people, who gathered to give a voice to all those who have no voice, the unborn. Like Niesen, Buhler was inspired by the presence of so many young people. “It gets me very excited for next year,” she said. By far, though, one of her favorite moments was hearing the archbishop’s words at the basilica. Buhler said she’s very excited about next year’s March for Life pilgrimage and is already thinking about ways she, religion instructors, campus ministers and the chaplain can work together to send a large contingent from Hayden next year. Establishing a culture of life in today’s society is something that Burk Schreiner, a senior at St. James Academy in Lenexa, plans to be more intentional about as a result of having made the pilgrimage. One way is just in talking with people about the reality of abortion whenever an opportunity affords him a chance to speak with people one-on-one. “The truth speaks for itself,” he said. He plans to “just present the facts” surrounding abortion and let God handle the rest. “I think that’s the most effective way,” he added.